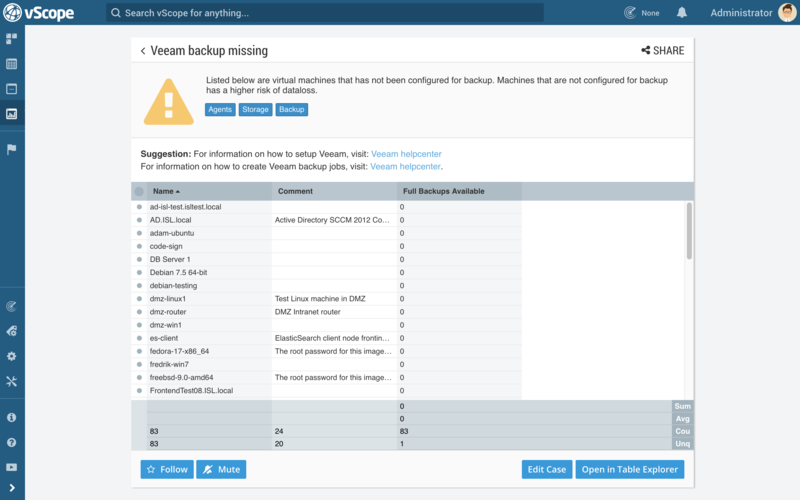 vScope Backup provides web based documentation and analysis that allows IT organizations to get a holistic overview of the backup status of their environment. The product goes beyond scripting and monitoring by providing a common and easy-to-use platform for IT to access accurate information about backup. Integrated on the vScope Core platform you will have a complete audit trail from backup job, to virtual machine, to database to storage. A powerful feature that allows you to view backup information side-by-side with data from other resources making vScope Backup valuable for billing/chargeback, compliance, GDPR, SLA follow up and/or project overviews. 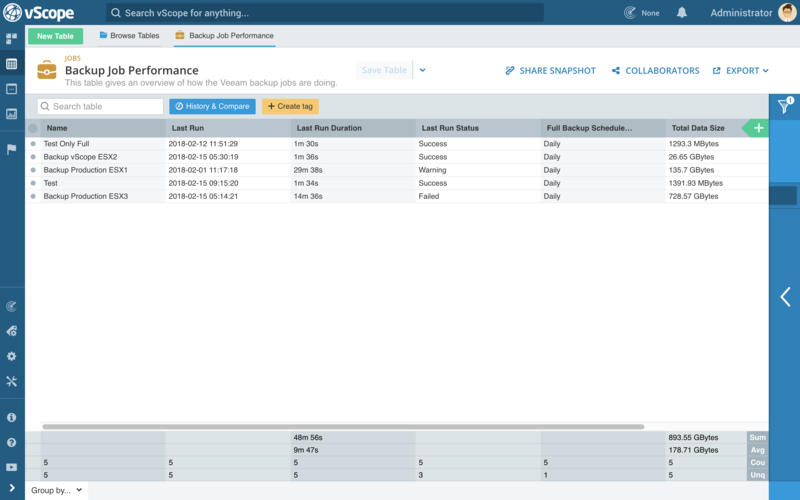 vScope Backup simplifies tasks and processes by reducing hours to minutes. Instead of spending resources on data collection and analysis, IT can focus on more valuable tasks and deliver better results for the business. 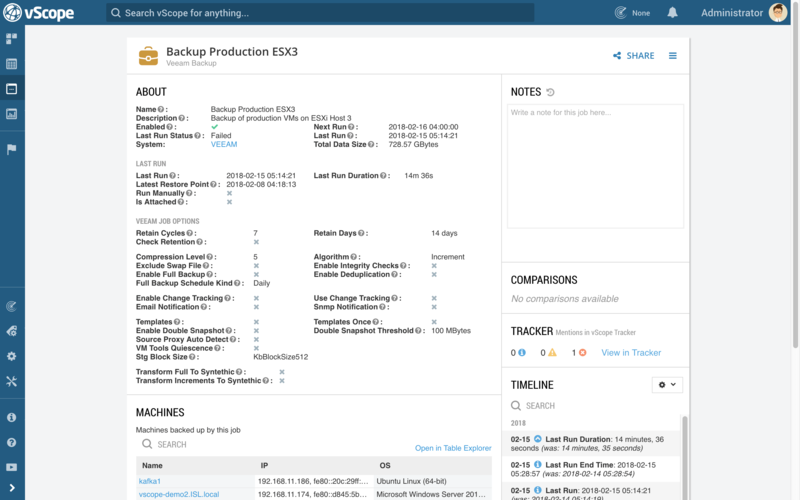 vScope Backup offers dependency mapping between technological platforms, allowing organizations to visualize information about, for instance storage and virtualization side by side with backup jobs. Automated audits removes manual data collection, analysis and reporting to support a productive IT organizations where resources can be spent on more important matters. Consolidate information at one place to reduce administrative efforts, lower the time to resolution and forecast resource and capacity planning. This helps ensuring people having time to focus on priority activities. 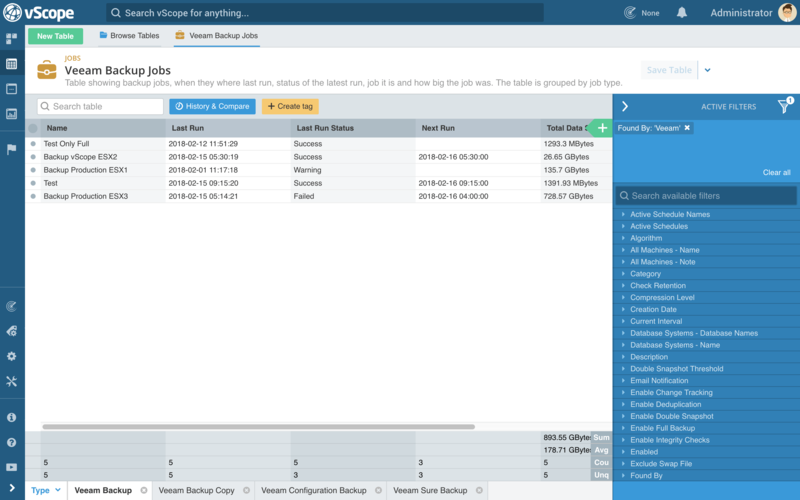 Go further than alerts about failed backup jobs and investigate VM configurations, database locations or storage information related to data backup. Browse all backup jobs from one single view to quickly identify failed or corrupted jobs that might put your data at risk. 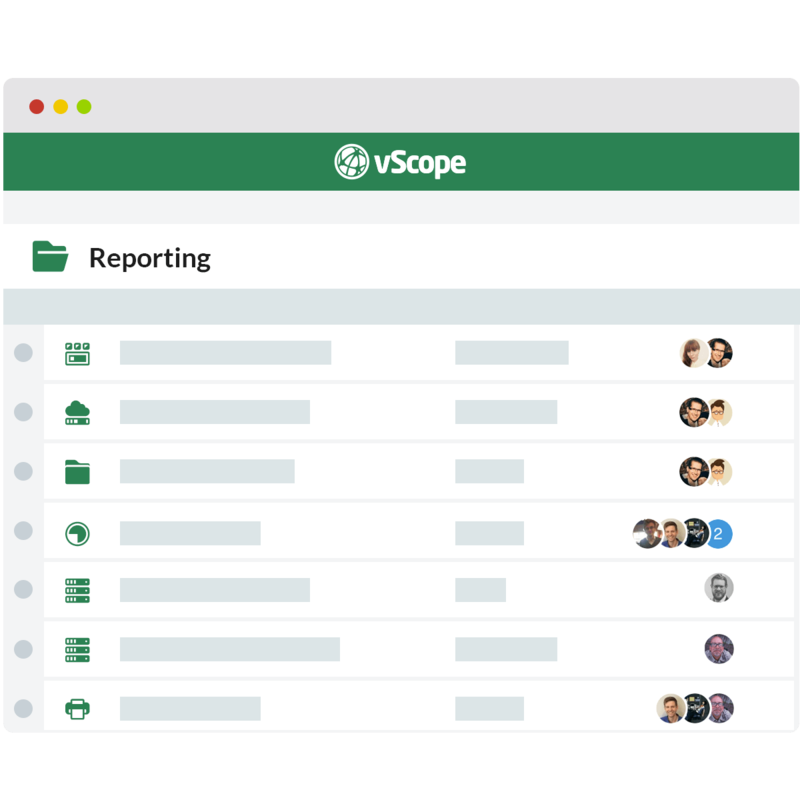 vScope Backup offers customizable reporting allowing IT to build tailored reports and dashboards to both internal or external parties. vScope Backup enables a variety of use cases for IT organizations. How can I use vScope Backup? vScope automates the efforts related to data collection, correlation and analysis allowing organizations to spend resources on more important matters. Designed for collaboration bringing IT professionals, management and project leaders together on the same platform. vScope brings visibility and offers a holistic approach to documentation and analysis of IT. Find out what is installed, how it is configured and what is utilized. Consolidated reporting and increased productivity helps Hosting & MSP increase the margin of their delivery. Automatic SLA reports and combining backup data with virtualization information allows Hosting & MSP to improve accuracy and the efficiency of their billing routines. Demonstrate service quality to communicate the value of your delivery. 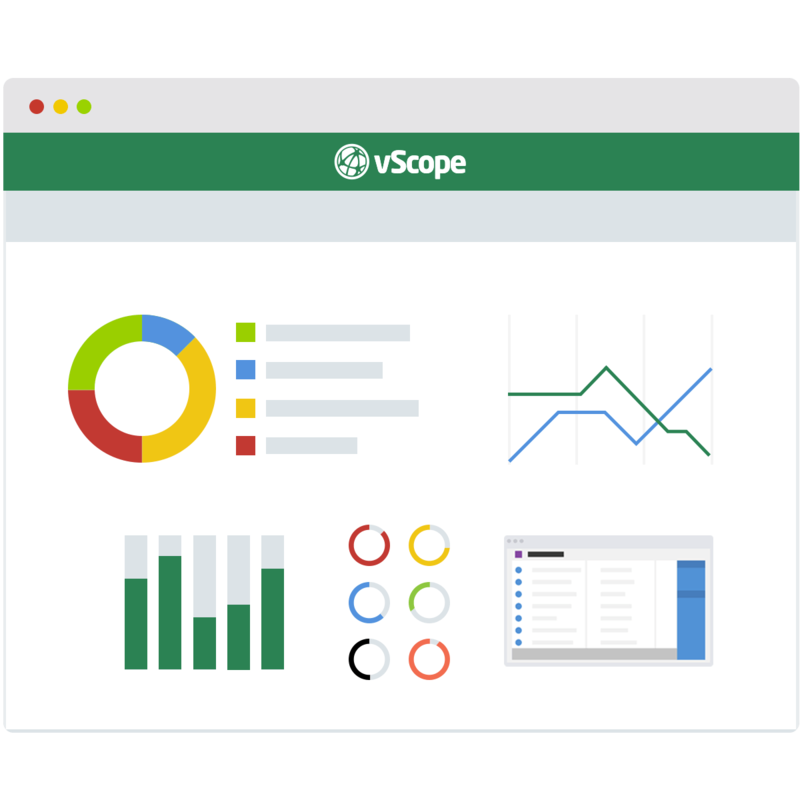 vScope enables scaleable audit of IT meaning that you can fit multiple tools into one single view. Besides facilitating productivity this also offers a more cost efficient solution. Reduce system administrator costs to troubleshoot failures, build reports for colleagues and free time to spend on more important issues. Built-in analysis guide IT to interesting findings related to industry best-practice and compliance. An in-house expert consultant working 24h a day, 7 days a week. 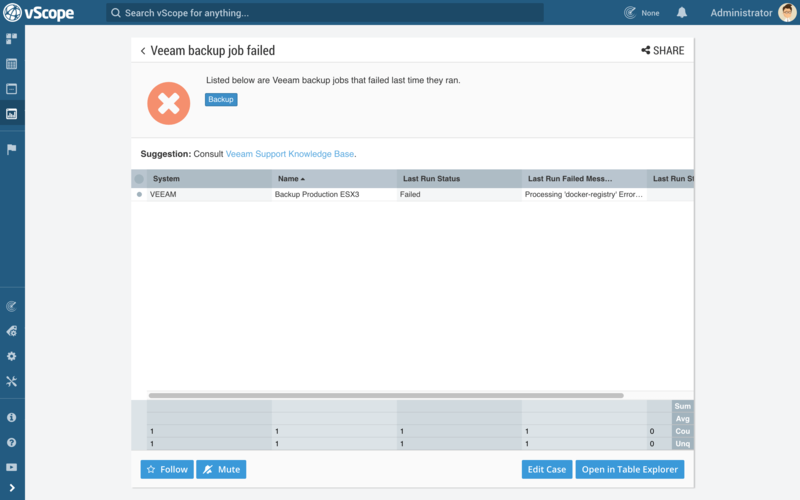 How is vScope Backup licensed? vScope is a subscription-based service with updates, service and support included. Products are licensed on the platform vScope Core, adapted to your environment and your situation. Every product is licensed based on “Billable Units” (BU). For vScope Backup a BU is a backup job meaning that if you, for instance, have 8 jobs you will licensed 10 BUs, 15 jobs = 20 BUs, 199 jobs = 200 BUs etc. Are you interested in what vScope Backup can do for your business? Contact us for a review or to find the answer to any of your questions.